CLEARANCE - Skylanders Swap Force Character Packs (Universal) ONLY $5.00 + FREE Pickup (was $10)! 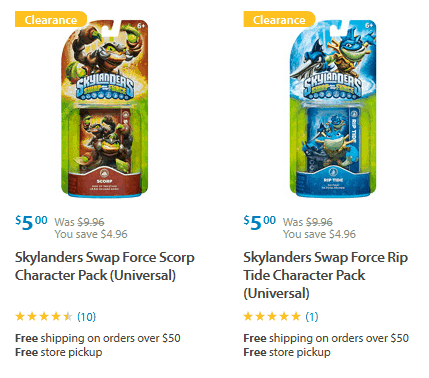 You are here: Home / Great Deals / CLEARANCE – Skylanders Swap Force Character Packs (Universal) ONLY $5.00 + FREE Pickup (was $10)! CLEARANCE – Skylanders Swap Force Character Packs (Universal) ONLY $5.00 + FREE Pickup (was $10)! Skylanders Swap Force Character Packs (Universal) ONLY $5.00 + FREE Pickup (was $10)! Check out these fab Walmart clearance deals! You can snag this Skylanders Swap Force “Scorp” Character Pack (Universal) and this Skylanders Swap Force Rip Tide Character Pack (Universal) for just $5.00 each + FREE Pickup (was $10)!